Learn how to make Chinese hot pot at home with this easy to follow guide. If you haven’t made Chinese hot pot at home before, it can seem a little bit daunting at first. Once you get the right equipment (which I’ll talk about later) and select your ingredients, you’ll be cooking in no time! 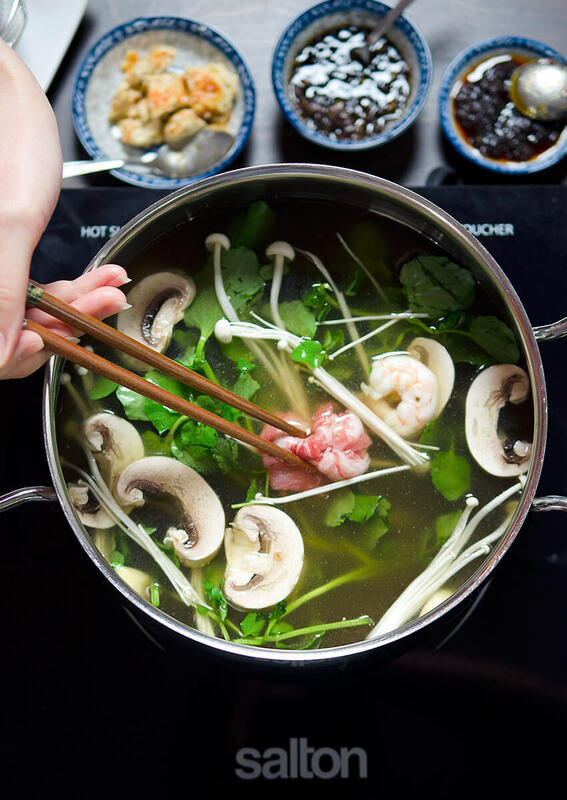 Keep reading this detailed guide to help you make Chinese hot pot at home. Chinese hot pot is an communal dish, where ingredients are cooked in hot broth right at the table. 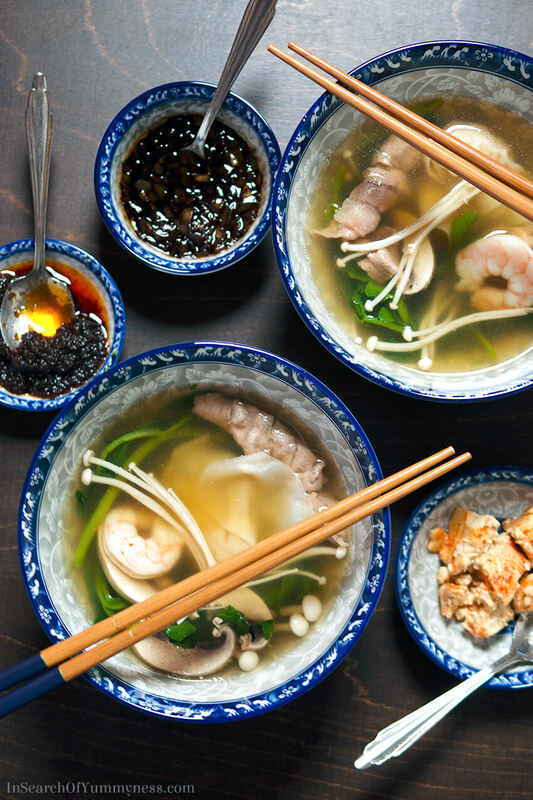 The cooked ingredients, which could include meat, seafood, vegetables and noodles, are dipped in a flavourful sauce, and the remaining broth is often enjoyed as well. This interactive way of eating is popular all across Asia, and each region seems to have its own version of the dish. 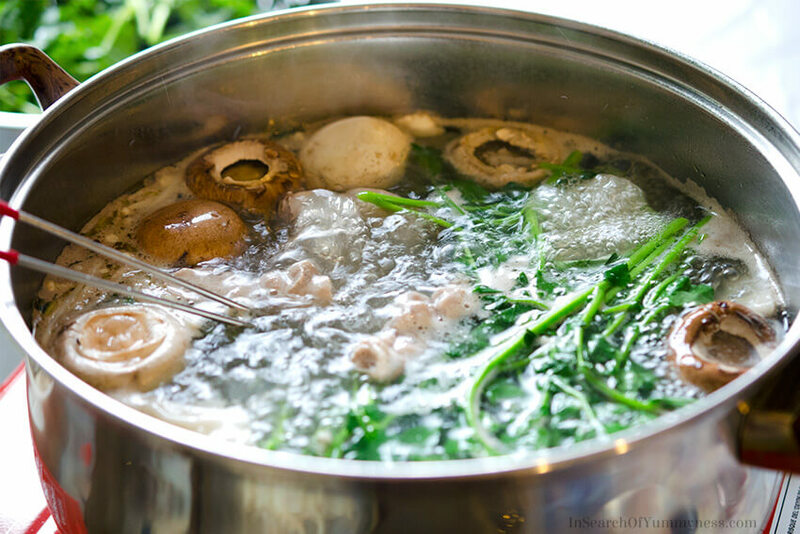 Many hot pot dishes feature thinly sliced meat, vegetables and noodles, but where you really see the regional flavour differences is in the broth and dipping sauces. Of course, there are many many versions of hot pot, and every family will put their own spin on the dish, but here are some general flavour variations from different areas. Japanese hot pot, called Shabu Shabu, has ingredients that are cooked in a kombu broth and then dipped in ponzu sauce. In Thailand, there’s a version called Jim Jum, which has a flavourful broth made with lemongrass, lime leaves, galangal and fish sauce (similar to Tom Yum soup), and a spicy dipping sauce. Mongolian hot pot is also known for having a flavourful broth, made with goji berries, jujubes (not the candy! ), black cardamom and herbs. Actually, the first time I experienced hot pot was at a Little Sheep Mongolian Hot Pot restaurant. This huge chain restaurant has locations across China, Japan, Canada and the United States, and while I have no idea how authentic they are, they do make really tasty broth! Chinese hot pot is called 火锅 (“huo guo” in Mandarin, “fo wo” in Cantonese), and is sometimes casually referred to as Da Been Low in Cantonese . The version of Chinese hot pot in this post has been influenced by my experiences with Mongolian hot pot, a cooking lesson with Mary from Mary’s Happy Belly (see the video at the top of this post! ), and conversations that I’ve had with Mandy about how her family (who are from Hong Kong) makes hot pot at home. How Do You Eat Chinese Hot Pot? The first time I had hot pot was at a restaurant, and I had no idea what I was doing. I had my own mini pot of broth and I thought that I was making soup. So I threw all of the ingredients in, simmered it, scooped it out (broth and all) and ate it. That’s not really what you’re supposed to do (and now I understand why the waiters were giving me a funny look). What you’re actually supposed to do is bring the broth up to a simmer on its own. You can add things like spices, herbs, garlic, spring onions, ginger for flavour, but that’s it. Once your broth is up to a simmer, it’s time to cook! If you’ve got your own mini pot (which is not traditional, but is offered at some restaurants) you can just add what you want to eat, cook it, fish it out and eat it. However, you’re not likely to make hot pot this way at home. I don’t know about you, but I don’t have space on my dining room table for more than one burner! When you’re sharing a large pot, you have to be considerate of the other people you’re eating with. Since everyone cooks their food together (see the etiquette tips below! ), it’s important to either agree to share what’s in the pot, or keep track of what you put in. 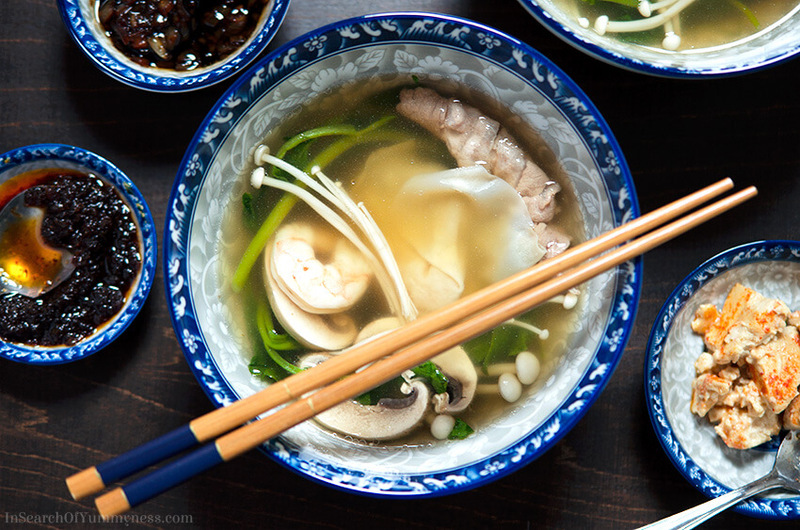 The easiest way to keep track of your ingredients is to either hold each item in with a clean pair of chopsticks, or add the items to a a small metal strainer and lower it into the broth. When Mandy and I visited Mary to shoot the video for this post, we all shared what went into the pot. Mary took the lead on cooking and added the noodles and greens (which we all shared) and then we took turns cooking our meat, seafood, mushrooms etc. In the end, things got lost in the pot (which happens) and we just divided up what was left. The same thing happened when Mandy came over to shoot the photos for this post, and we had hot pot with the rest of my family. Mandy and I took lead on cooking, and we all shared most of what went into the pot, with everyone cooking their own meat and small vegetables. It’s important to make sure that your ingredients are cooked properly before you remove them. While some items, like beef, can be eaten rare, you wouldn’t want to bite into a half-cooked shrimp! Of course you also don’t want to overcook your food either, so be sure to keep an eye on how things are cooking in the broth. As your ingredients become cooked, you remove them from the broth and add them to your bowl. Once you have what you want to eat in your bowl, you can either add in your dipping sauce and eat everything together, or dip each item into your sauce individually. This part is a personal preference thing – it doesn’t really matter how you do it. Can You Eat the Broth? Yes, you can eat the broth. However, there are a couple of things to keep in mind. First, if you’re starting with water and a flavouring mix as your broth, or are using a weak broth, it’s not going to be very tasty at the beginning of the cooking process. You will want to wait until you’ve cooked some of your ingredients before sipping the broth, so it has time to take on some flavour. This is also why some people choose to wait until closer to the end of the meal to add their noodles in (so they can absorb the flavourful stock). Some people don’t eat the broth until the end of the meal, but I’ve found that the broth becomes too fatty by then. As you cook your meat, the fats will begin to melt into the liquid, which can be tasty… but too much of that leaves a greasy film on your tongue. Again, this is a personal preference thing that you’ll figure out as you cook. When you’re having hot pot with your family, you can be a bit more relaxed, but you’ll definitely want to stick to these guidlines if you’re sharing hot pot with friends! If you’re cooking two types of broth (plain and spicy) at the same time, do not cross dunk your ingredients. This keeps the flavours of each broth from becoming contaminated with the other. Use the courtesy chopsticks to cook your food, not the ones that have been in your mouth. If you’re not sure if someone else added an ingredient to the pot, ask before eating it. Don’t be that person who eats someone else’s perfectly cooked scallop! What Equipment Do You Need to Make Chinese Hot Pot? Chinese hot pot doesn’t have to be complicated, but you do need a few key pieces of equipment to make this successfully. While it might be tempting to make this dish on your normal stovetop, it just won’t work properly. Trust me, I’ve tried that! Here’s what you’re going to need. You know how fondue only works if you’re cooking at the table? The same goes for hot pot. You need to have a pot of broth simmering in the middle of the table throughout the entire meal, which means you’re going to need a portable source of heat. Portable butane burners are a popular choice, as they are powerful and it’s easy to control the heat settings on them. These can be dangerous though, and many models specifically say they are for outdoor use only (they are generally sold as camping stoves). If you are going to use one indoors, you should consider opening a window to let in some fresh air. Another point to consider is that you will need to replace the butane canister occasionally, as you use it up. A safer option is use to an electric countertop burner, as these are made for indoor use and are easier to clean too. I haven’t used one of these myself, but they look like a nice option. Another safe option is an induction cooktop, which is what I have at home. These are also safe for indoor use, and are easy to wipe clean. They are also energy efficient and often have a wide range of temperature settings. The downside of an induction cooktop is that the pot has to be magnetic (that’s how induction cooktops work). So while most metal pans will be able to conduct heat, copper-bottom and ceramic pots will not work on this cooktop. They can also get really hot really fast, so you need to learn what setting works best for this dish. If you’ve ever been to a hot pot restaurant, you’ve probably seen the stainless steel pots that have a divider down the middle. These pots are great because you can put regular broth on one side and spicy broth on the other. Buying a single pot like this makes sense if you already have a burner, and it’s easy to store. Another option is an electric hot pot. This device has two pieces – a burner and a pot. This is handy if you don’t already have a portable burner, but the downside is that you can only use this burner with this specific pot. Also, the unit it larger, making it harder to store when you’re not using it. You can also find hot pots that come with lids and accessories, which may be appealing to you. I just use a regular metal pot with a lid when I make hot pot at home, but my pot is a bit too deep so it can be hard to find the ingredients in there. A shallow pot is better, because not only can you keep track of what’s cooking, but it’s easier to fish out the items too. If you want to keep things simple, you can just use chopsticks to cook and eat with. However, there are a few other tools that can make your hot pot experience a bit easier. For example, small tongs can be quite handy. You will also need small bowls for your dipping sauce, spoons, and larger bowls to eat from. Each person should have their own pair of chopsticks to eat with. There should also be courtesy chopsticks which everyone can use to add the ingredients in the pot. This way, no chopsticks are going from someone’s mouth to the pot and vice versa. Shallow metal nets are handy for removing cooked items from the broth. These are tricky to cook with, because the food tends to fall out of them once you place them in the water. Deeper nets are easier to cook with, and some of them even have a hook so you can attach it to the pot. What Ingredients do You Need for Chinese Hot Pot? Chinese Hot Pot can range from an inexpensive way to use up leftovers to an expensive meal fit for entertaining. It all depends on the ingredients that you choose to add to your pot. Obviously, meats and seafoods are going to be your most expensive ingredients, but if you have to buy all of the sauces you want too, your first bill can get pricy fast! Think about the flavours that you enjoy and build up a reasonable grocery list from there. Below are some options for ingredients that you can add. You can add waaay more items, but these are some basics that you might enjoy. 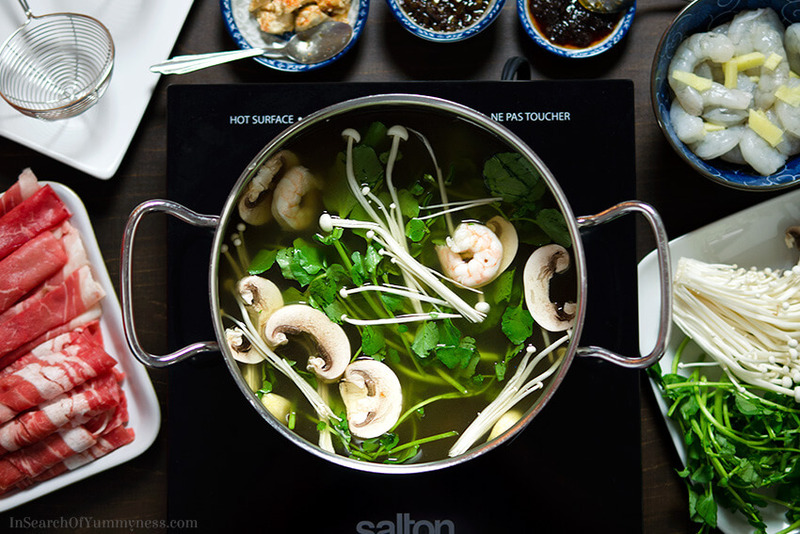 The first most important ingredient for Chinese hot pot is the broth. You can use plain water and just add some flavouring to it, like this soup base from the restaurant chain I mentioned earlier. Also, large Asian groceries like Nations and T&T sell seasoning packets and soup base seasonings that you can add to water too. Otherwise, chicken stock seems to be the popular choice for the broth. Homemade is great, but of course you can use your favourite store-bought brand too. The dipping sauce for Chinese hot pot should be made with soy sauce. You could use soy sauce on its own, but it’s extra tasty if you mix other ingredients into it. 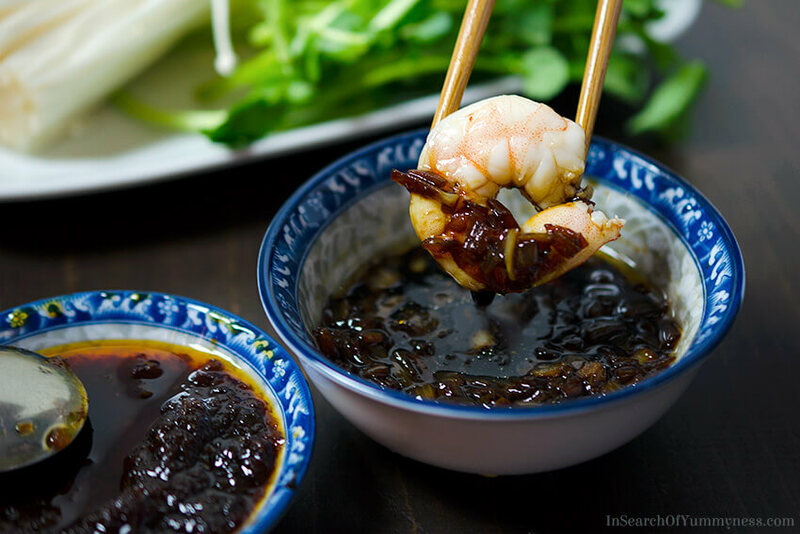 Mary makes a delicious dipping sauce with about a 1/3 cup of soy sauce, 1 sautéed finely diced shallot, a drizzle of sesame oil, and a little bit of sugar. She thins the mixture down with water, and adds lemon juice if it’s a bit too salty. The meats should all be thinly sliced so they can cook quickly. 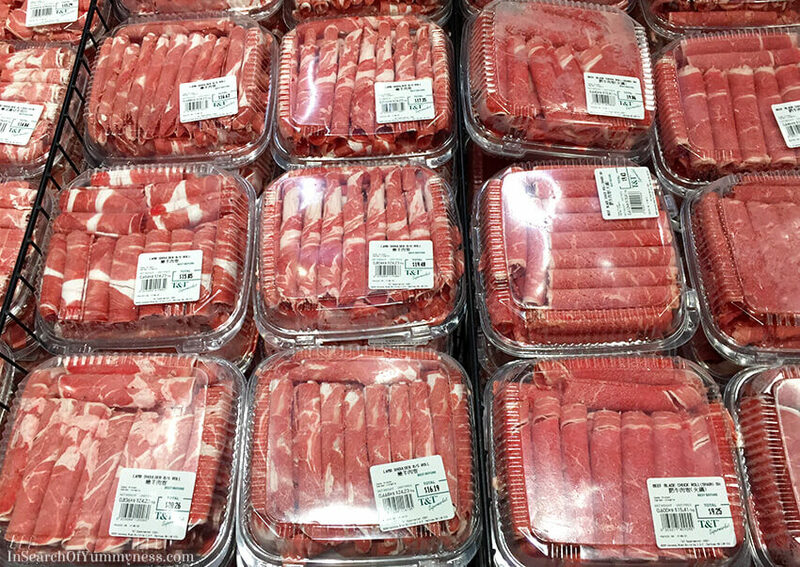 Many Asian groceries (and even Real Canadian Superstore) sell rolled up slices of meat specifically for hot pot. Keep these items cold in the fridge until ready to cook. I do not recommend using raw chicken in hot pot, as it is dangerous to consume chicken that is not fully cooked, and there’s a risk of cross contamination with other items. All fish and seafood should be cleaned, prepped and cooked from raw. Keep these items cold in the fridge until ready to cook. Add the sautéed shallot to a small bowl, and combine with the other dipping sauce ingredients. Taste and adjust seasoning as needed. Set aside for later. Once the brother is simmering, take turns adding ingredients into the broth. Allow all raw items to cook fully before removing and adding to your bowl. Dip cooked ingredients into dipping sauce, or top with condiments are desired. Please note that this recipe is just a basic guideline. 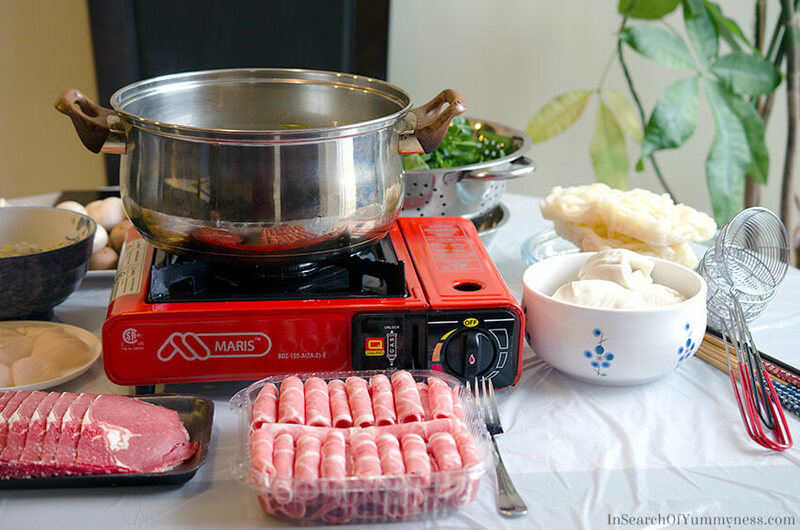 Be sure to read the accompanying blog post to get information on the equipment, ingredients and tips for making Chinese Hot Pot at home! Provide chopsticks (or forks) for everyone to eat with, but also have an extra pair for cooking. Cover your table with a plastic tablecloth to protect it from spills and stains. Follow the safety instructions for your portable burner. Keep meats, fish and seafood cold in the fridge until you're ready to eat. Discard any meats, fish or seafood that has been sitting out at room temperature. Also discard any decanted sauces or condiments. Leftover vegetables should be refrigerated promptly. Turn the heat off on the burner and allow to cool. Discard any remaining stock from the pot once everyone is done eating. Wipe down the (cooled!) burner and table. Thank you to Mary from Mary’s Happy Belly for collaborating on the video, and for teaching me how to make your version of hot pot! Thanks to Mandy for filming every scene that I’m in, and assisting with the photo shoot too! Thanks to Keith for giving me the Chinese name for hot pot ( 火锅 (“huo guo” in Mandarin, “fo wo” in Cantonese)! What an interesting article! I have heard of hot pot but never quite understood what it was. Now that I know, I am tempted to try it for a family dinner. Thanks for reading Liliana! It’s really simple once you know what you need! If you do give this a try, let me know how it goes! My daughter introduced us to Hot Pot at the end of 2016. When we first entered the restaurant I was wondering to myself what were we getting ourselves into. By the end of the evening we were hooked and it has become our favorite place to eat when we are in Edmonton. Everything is so fresh that you can not help but enjoy it. As my daughter and her husband live 500 kms away from the closest Hot Pot spot I bought her an induction burner so they can enjoy Hot Pot at home. And just this week after spotting some gorgeous baby bok choy in store I was inspired to make hot pot at home as well. So good! Everyone needs to try this eating experience at least once. It is spectacular and we always comment that we are so thankful she took us there that snowy evening in 2016. Have a wonderful weekend Shareba! That’s a lovely food memory for your family! It’s nice that you got her a pot for her to use at home, too. I agree, hot pot is an experience that everyone should try at least once! I had no idea what to expect the first time I tried it, but it has quickly become one of my favourite ways to eat during the winter months. Thanks for stopping by Redawna, I hope you’re having a good weekend too! What a fantastic and informative post! I’ve had hot pot in restaurants, but have never tried to do it at home. But now you’ve given me a great idea for our next dinner party. Great work, Shareba! It’s definitely a fun dinner party idea! Thanks for reading Colleen! I love having hot pot at home! So easy and no thinking involved. Just a little bit of prep to wash all the veggies but that is all. We typically have all the sauces out and then everyone makes their own dipping sauces; though good to have some examples of what works! Sometimes I find using two coloured chopsticks for each person has…as long as they remember which one is the raw one and the one for eating! I’ve also found just using those electronic skillets that people use for making lasagna or cooking on works really well. Hamilton Beach has a big rectangular one that I use and that helps so that everyone can get in on the action! Using two coloured chopsticks is really smart! So is using the electric skillets – I wouldn’t have thought of that. Thanks for the tips Lillian! Wow! How delicious does this look! What a thorough and amazing post!